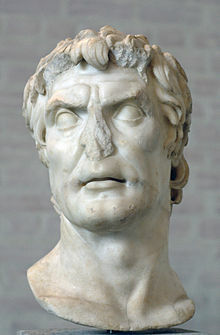 Lucius Cornelius Sulla  (c. 138 BC – 78 BC), usually called Sulla, was a Roman general and statesman. He was a praetor (a commander of an army) in 97 BC, and held the office of Consul twice. He was the only man in history to have attacked and kept both Athens and Rome. Sulla unconstitutionally marched his armies into Rome and defeated his enemy Gaius Marius in battle. After his second march on Rome, he revived the office of dictator. Sulla was made Dictator in 81 or 82 BC. He had the Senate draw up a list of those he considered enemies of the state and published the list in the Roman Forum. Plutarch states in his Life of Sulla (XXXI): "Sulla now began to make blood flow, and he filled the city with deaths without number or limit". This was remembered when Caesar became Dictator. ↑ L•CORNELIVS•L•F•P•N•SVLLA•FELIX is his name in Latin; In English, it means "Lucius Cornelius Sulla, son of Lucius, grandson of Publius, the lucky". ↑ Keaveney, Arthur 2005. Sulla: The last republican. 2nd ed, London: Routledge. ISBN 978-0-415-33660-4. This page was last changed on 28 June 2018, at 01:02.